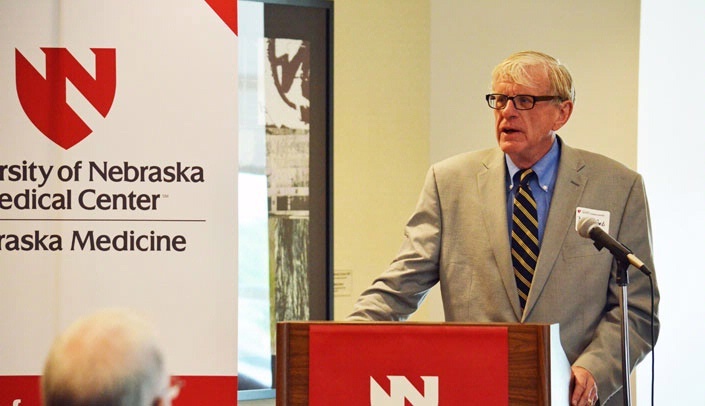 Congressman Brad Ashford spoke at UNMC Wednesday. The Fred & Pamela Buffett Cancer Center yesterday hosted about 50 people at a watch event to view a broadcast of Vice President Joe Biden's address from the National Cancer Moonshot Summit in Washington, D.C. In his remarks, the vice president said he was charged by President Obama to lead the national initiative, which aims to "make a decade's worth of progress in the next five years." See a photo album of images from the event here. The group in the Linder Reading Room in the Sorrell Center joined groups from around the country watching the proceedings. The vice president called out "Hastings, Nebraska" when saluting those taking part via remote technology. U.S. Congressman Brad Ashford, Laurie Petty, constituent services representative for U.S. Sen. Deb Fischer, and cancer survivor Angela Turner, who was a patient at the medical center, were guests at the event, which also included representatives from the American Cancer Society Cancer Action Network, Inc., and The Leukemia & Lymphoma Society. The vice president pledged that the Moonshot would help remove barriers to progress -- "get out of the way." "You guys," he said, addressing those taking part in the fight against cancer, "need to figure out how to get in each other's way more." In other words, collaborate. That's the very spirit of the Fred & Pamela Buffett Cancer Center, said Kenneth Cowan, M.D., Ph.D., the center's director, in his remarks. "The facility was designed to accommodate space where patients will be seen by everybody," Dr. Cowan said. As in, literally seen, so everyone who works at the center will have a shared sense of purpose. "The team includes everybody," Dr. Cowan said. Turner, a cancer survivor, agreed, expressing thanks to everyone from Dr. James Armitage, who had given her his home phone number, to anyone who held any role at the medical center. Though she said she is normally a strong person, she was openly emotional when talking about what a cancer diagnosis means to anyone with kids. She agreed with the spirit of the Moonshot initiative, especially Biden's call for a greater sense of urgency. "Why wait?" she said. "Let's do this right now. People don't have time." Congressman Ashford recalled his friendship with the vice president, and told of having recently visited a young cancer patient in Omaha. "This center will have significance," he told the group. "Thanks for all that you do for the whole world." I wish I were allowed to help.